Dual Ball Bearing GT25/40-R Turbo assembly with specified ar. T25 style inlet flange with 5 bolt style exit. Large 60- 1 style compressor housing with 4.00" inlet and 2.50" outlet. 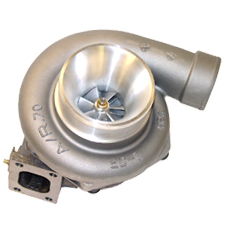 Very Good response turbo for 4 Cyl applications. This turbo has a flow capacity of about 450HP.